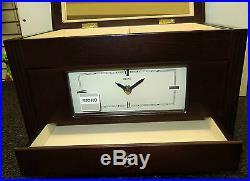 BEAUTIFUL SEIKO JEWELRY BOX WITH CLOCK (COMBINATION) IN A DARK BROWN WOODEN CASE - MEASURES 12"W X 9"D X7.5H. WHEN THE TOP IS OPEN THERE IS A BEAUTIFUL MIRROR AND A BEAUTIFUL (OFF WHITE) VELVETLY SPACE IS DISPLAYED - MAY BE USED TO STORE JEWELRY. THIS PIECE LIFTS UP TO REVEAL ANOTHER SECTION THAT CAN BE USED TO STORE 4 WATCHES. AT THE BOTTOM OF THIS JEWELRY BOX IS A DRAWER FOR FURTHER STORAGE. 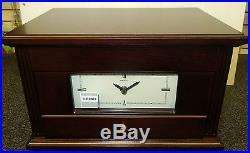 IN THE FRONT OF THE JEWELRY BOX IS A BEAUTIFUL RECTANGULAR CLOCK. CLOCK DIMESIONS ARE: 5.75 "W X 2.25"H. RUNS ON ONE "AA" BATTERY (INCLUDED). Some items are too large or delicate to combine... INTERNATIONAL BUYERS OUTSIDE the 50 states of the U. 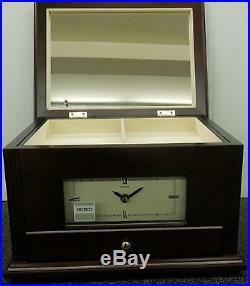 The item "SEIKO WOODEN CASE JEWELRY BOX WITH CLOCK QXG141BLH" is in sale since Thursday, January 2, 2014. 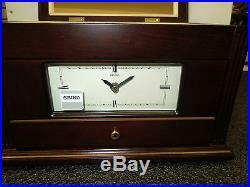 This item is in the category "Home & Garden\Home Décor\Clocks\Wall Clocks". The seller is "sweetpeaches517" and is located in Milwaukee, Wisconsin. This item can be shipped to United States, Canada, United Kingdom, Denmark, Romania, Slovakia, Bulgaria, Czech republic, Finland, Hungary, Latvia, Lithuania, Malta, Estonia, Australia, Greece, Portugal, Cyprus, Slovenia, Japan, China, Sweden, South Korea, Indonesia, Taiwan, South africa, Thailand, Belgium, France, Hong Kong, Ireland, Netherlands, Poland, Spain, Italy, Germany, Austria, Israel, Mexico, New Zealand, Philippines, Singapore, Switzerland, Norway, Saudi arabia, Ukraine, United arab emirates, Qatar, Kuwait, Bahrain, Croatia, Malaysia, Brazil, Chile, Colombia, Costa rica, Dominican republic, Panama, Trinidad and tobago, Guatemala, El salvador, Honduras, Jamaica, Bahamas, Viet nam, Uruguay.